The Apple 1 is the most sought after collector piece of computing hardware. It is the Action Comics No. 1 of retro computing. The first appearance of Superman. The one that started it all. But if there was to be a No. 2, it would be this guy—the Commodore 65. Although it doesn't have the meteoric sales numbers like the Apple 1, it is almost on par in rarity. Only 50 to 200 Commodore 65 (also known as Commodore 64DX) still exist. This prototype, created in 1990, "was intended to be the last great 8-bit system," according to Hackaday's Brian Benchoff, who spotted the original eBay listing. 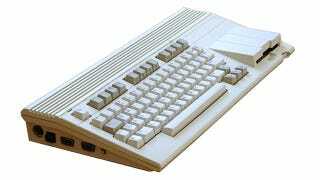 The C65 was meant to be backwards compatible with the C64 but also provide Amiga-level features of the time. The project began in late 1990 but was soon canceled. When Commodore was liquidated years later, some C65 computers were sold to the public, mostly likely the same machines circulating on auction websites today.